Kovar(R) (also known as Rodar) is an Iron-Nickel-Cobalt alloy (with some other alloying elements in small percentages). It has similar a similar coefficient of expansion to hard borosilicate glasses (such as Pyrex (R)) and select ceramics, and is formed in a manner to permit consistent expansion and contraction under various thermal conditions. 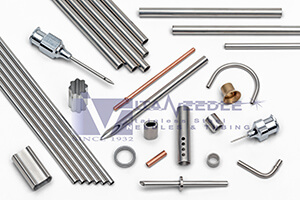 This alloy is often used in applications requiring an excellent hermetic seal around a tubular part, and can be found in microwave/power tubes, and components requiring an inlet into an otherwise enclosed space. 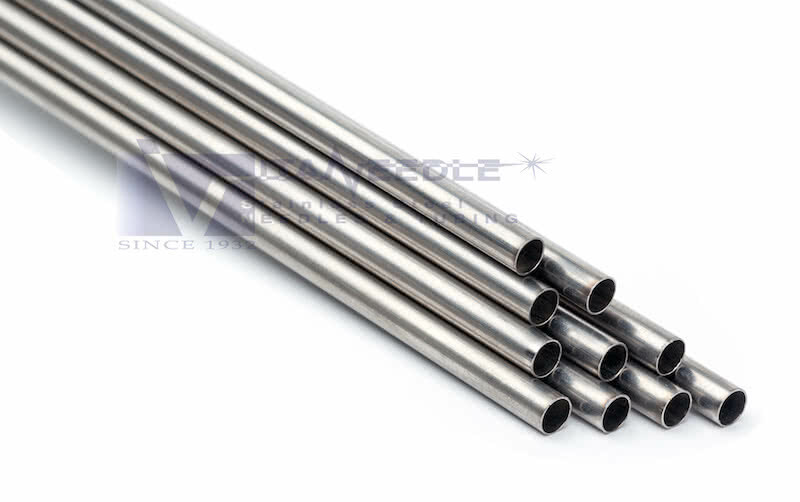 The Kovar(R) tubing alloy is occasionally referred to as as 29-17 alloy or ASTM F-15. Monel 400 is a high nickel alloy consisting of approximately 67% nickel and 23% copper. It has good corrosion resistance, especially in salty and caustic reducing environments. Its tensile strength can be increased through repeated work hardening. With good mechanical properties below zero degrees Fahrenheit and up to temperatures of 1000 degrees Fahrenheit, it can be used in a wide variety of applications. Most commonly, Monel 400 tubing is found in marine engineering, chemical/petroleum, distillation and heat exchanger applications. Composed of 52% Nickel and the balance Iron, this alloy shares a similar coefficient of expansion to soft glass, making it useful in lighting and sensor applications. A high nickel alloy typically used for applications requiring corrosion resistance at high temperatures. Excellent mechanical properties across a wide range of temperatures. Similar corrosion characteristics to Alloy 600, this alloy has very useful strength characteristics at higher temperatures and is often used in load bearing components exposed to high temperatures & oxidizing environments. Nickel-Chromium alloy with added molybdenum and niobium that enhances corrosion and oxidation resistance.